France's premier wine-making region produces some of the greatest vintages of all time, but it has historically not taken kindly to visitors—until now. 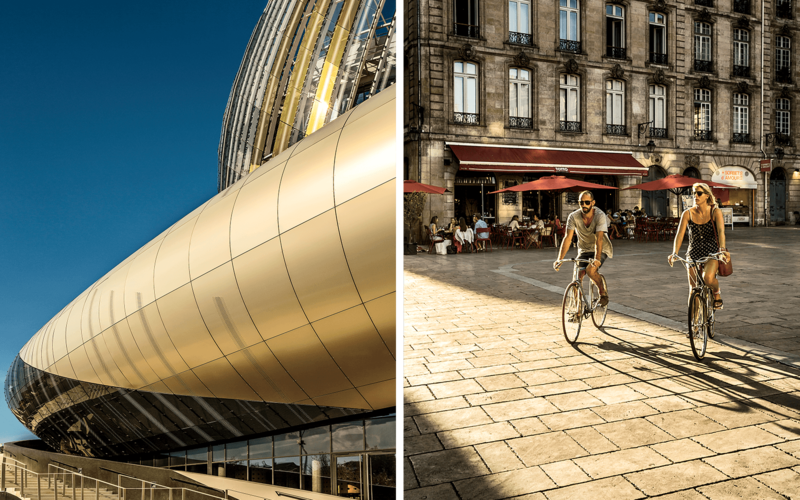 From the city to the grand old châteaux beyond, Bordeaux is showing a fresh face to the world. I confess I came late to Bordeaux. My experience with wine began as a kid growing up in Buffalo in the 1950s. My paternal grandfather, Gaetano, who emigrated from Sicily, concocted a rough-edged wine in the backyard every fall. One year red; one year white. He “aged” it for a few months in old whiskey barrels to give it a bigger bite and watered it down for me and my siblings to sample. During my first decade living in France, I mostly avoided visiting the Bordeaux wine region. To many, the very name means old-fashioned, snobbish, and unaffordable. For centuries, its winemakers have created some of the world’s most prized and expensive wines—Thomas Jefferson was famously devoted—and they devised a system of classifying them that hasn’t changed since the days of Emperor Napoleon III. It was with the Bordeaux mystique in mind that early one morning, under clouds pregnant with rain, I boarded a riverboat to take me up the Garonne into the city of Bordeaux. As I made my way through the slow-moving waters, it was as if I were being ferried from the 18th century into the future: I passed rows of low, elegant limestone buildings that, in prerevolutionary times, had defined the city as a center of wealth and the most important port in France. Left: The Cité du Vin, a sweeping new complex that celebrates wine making both in France and around the world. Right: The city of Bordeaux. Then suddenly, as if the wine god Dionysus had willed it with his staff, the sun broke through. As we looped around the bend in the river, a modern structure caught the light and shone in glorious gold and silver. This was the Cité du Vin, the $85 million architectural flight of fancy that opened last June. Part museum, part visitors’ center, part mini theme park, it was born of a collaboration among a number of players, including the city of Bordeaux, the Bordeaux Wine Council, and Crédit Agricole Aquitaine bank. Its stated mission is to promote “the cultural, universal, and living heritage that is wine” to visitors from around the world. Some say the structure is poetry in motion: a thick, curved appendage representing wine swirling in a glass atop a vast round vase. Others call it a metallic whale with a funny-looking tail. Its two French architects describe it as “an evocation.” No matter. For the residents and vintners of the region, it is the symbol of Bordeaux’s quest to both revive its principal city and to shake off centuries of insularity and moribund tradition. As I traveled around the city and into the vineyards beyond, I could see efforts everywhere to turn the epicenter of old-world wine making into a more modern, global capital of wine. There was a time when the city of Bordeaux, much like the surrounding wine country, was an unwelcoming destination—the kind of place you got in and out of quickly. The first time I visited, years ago, I found a city of darkness with its back to the river and buildings veiled in 100 years of soot. That was before Alain Juppé, the former prime minister and presidential hopeful now in his fourth term as mayor of Bordeaux, launched a bold urban-renewal project. The city razed the abandoned warehouses along the waterfront to create a pedestrian walkway and bike path. It cleaned the soot from the limestone façades of the Bourse, the Grand Théâtre, and the main cathedral, then insisted other property owners do the same. It installed a 41-mile tram system and banned cars from much of the city center. In 2017, a major renovation of the central railroad station will be complete, and a new high-speed train line will cut the travel time from Paris by more than a third—to a mere two hours. Rather than use the city as a transit point for vineyard-hopping, visitors are now being encouraged to stay a day or two, as I did. Le Boutique Hotel—a wonderful 18th-century town house with UNESCO status as an architectural treasure—was my first choice. Bordeaux has traditionally suffered from a lack of good hotels beyond the Grand Hôtel, which I found bland. But lately, smaller properties with more character have opened. Le Boutique has a cozy wine bar with an excellent selection, along with eclectic rooms and suites that conjure the wealth and sumptuousness of this historically rich city. Another reason to stick around Bordeaux now is a wave of neo-bistros led by young chefs—one of the most gifted of whom is Victor Ostronzec of Soléna, a small, stark place on Rue Chauffour that he took over last year. Ostronzec insisted I try nearly everything on the menu, including gambas with pea purée and roasted lemon, mixed raw and cooked green and white asparagus with a pistachio vinaigrette, sea bass with a cauliflower emulsion, and ris de veau with caramelized onions. I was too full for dessert. No way, he said, serving me his specialty: a version of baba au rhum wrapped in whipped cream, with fresh strawberries and a quenelle of olive-oil sorbet on the side. I never order baba au rhum—it reminds me of the syrupy-sweet versions I had as a kid. But this baba was in another league—a gastronomic souvenir I will cherish (and order again). My friend Jean-Claude Ribaut, a Parisian food critic, was also in town and stressed the need to balance the nouveau dining experience with classic Bordeaux cuisine at Brasserie Bordelaise, in the old city center. It is always packed with locals who come for the excellent foie gras, oysters, and local sausage. In season, the must-have dish is lamprey prepared by boiling its blood down into a thick sauce with red wine, onions, leeks, cloves, and lardons. I found it heavenly. We hopped the tram for the short trip to the Chartrons quarter, where British, Flemish, and Irish wine merchants once lived and traded. Lately, it has morphed into a cool, gentrified neighborhood of residential lofts, art galleries, restaurants, and boutiques. Part of its charm is that it is still in the stages of becoming: some abandoned buildings stand out in their sooty blackness, while others have been scrubbed to a creamy beige. Left: The lobby at La Grande Maison hotel. Center: Baba au rhum at the hotel's restaurant. Right: Inside the Cité du Vin. It’s against this backdrop that the Cité du Vin makes a Guggenheim Bilbao–esque impression. Inside, what’s most striking is how much it breaks from the usual Bordeaux chauvinism by focusing on the global impact of wine in history. The ground-floor Latitude20 wine bar stocks 800 wines from more than 70 countries, while on the ninth floor, the Belvédère is the place to go for a glass of non-Bordeaux. There are two restaurants: a snack bar and a more upscale place on the eighth floor with panoramic views and a modern French menu that rotates with the seasons. For the people and the winemakers of Bordeaux, the museum—with its fluid and daring design, its shiny façade that changes color with the time of day—represents even more: a feeling of optimism about the future that’s often lacking in France these days. I set out the next day on a vineyard tour, to see how the hopefulness of the Cité du Vin has permeated wine country itself. There are some 6,500 wineries spread across 275,000 acres of the surrounding province. It’s the country’s biggest designated-wine-producing region—three times larger than New Zealand’s wine territory and about the same size as Chile’s. In 2015, some 640 million bottles of Bordeaux were sold around the world, ranging from the ordinary to the excellent. There’s a ritualized way its most prestigious bottles are sold—a process, called en primeur, that creates distance from the consumer. Every spring, the owners of the most prized châteaux invite thousands of wine merchants, experts, and journalists to taste the latest harvest. Each imagines what the wine will taste like when it reaches maturity, and their predictions set its price. Traditions like these had, in the past, made Bordeaux a stuffy, old-fashioned place to visit. It was hard for a visitor without a wine pedigree to tour the most famous châteaux, and if you were able to snag an invitation, the reception could be cold and formal. I always found the smaller regions, like the Loire and Burgundy, to be less forbidding. But in recent years, fierce global competition has forced Bordeaux winemakers into the 21st century. Estate owners have had to modernize their methods, rebuild their cellars, and open their doors to outsiders. A “grands crus” weekend each May gives the public the chance to taste wines from the region’s 118 top producers, while Bordeaux Fête le Vin, held every other June on the banks of the Garonne, is touted as one of the largest wine-tasting-tourism events in the world. There’s now the Urban Wine Trail through the city—a selfguiding itinerary that lets participants sample Bordeaux wines at more than a dozen establishments. As part of its campaign to democratize the Bordeaux wine world, the Wine Council also promotes themed wine tours of vineyards owned by women or younger vignerons or of ones that feature contemporary art or sculpture gardens. I followed its suggestion of a trip to the down-to-earth Blaye region, site of the 17th-century citadel complex built by Louis XIV’s military engineer Vauban to defend Bordeaux from maritime invasions. I found no hint of the red carpets, violin music, or orchid-filled dining rooms that characterize the best-known and most promoted châteaux. But I did discover Château la Grolet, where 31-year-old Rachel Hubert uses biodynamic farming methods—no pesticides—on vines set in 74 acres of meadows and woods, and her 35-year-old brother, Guillaume, is experimenting with storing wine in terra-cotta amphorae from Italy. Left: Vineyards in St.-Émilion, one of the most venerable wine-making areas of Bordeaux. Right: The net-bistro Soléna, one of several in the city of Bordeaux that are helping to change its staid reputation. 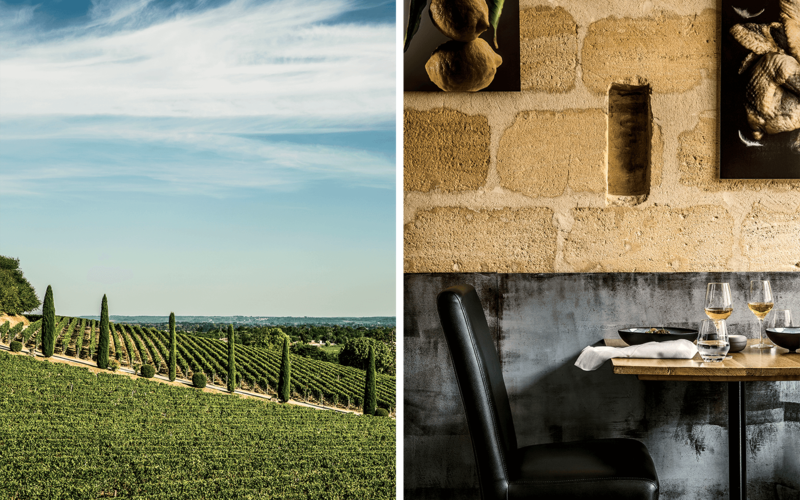 As worthwhile as the modest places are, much of the new Bordeaux approach is about heralding its wine making with architectural showpieces costing millions of dollars. Foster & Partners, for example, designed a new production facility at Château Margaux with glass walls and a dozen white steel “trees” that act as support pillars. I prefer the cellar designed by Jean Nouvel at the family-owned Château la Dominique vineyard, near the medieval village of St.-Émilion. The façade is clad in red stainless-steel slats made by the same factory that produces metalwork for the artist Jeff Koons. They reflect shadows and sunlight, and evoke the tones of red wine in a glass. La Dominique’s restaurant upstairs has floor-to-ceiling windows that overlook Pétrus and Château Cheval Blanc (with its white spaceship of a wine cellar), two of Bordeaux’s most celebrated wineries, and the village of Pomerol. Just outside is the terraced roof garden with a “swimming pool” that is filled not with water, but with thousands of smooth, red-glass oval pebbles. Visitors can walk on the pool and take a pebble as a souvenir. The price tag for the structure was nearly $12 million—a dramatic upgrade from the dungeon-like cellars of old. To learn more about the changes in the Bordeaux wine world, I called on Patrick Maroteaux and Jean-Michel Cazes, two crusaders of modernization who happen to be friends. In 1988, Maroteaux bought Château Branaire- Ducru and its accompanying wine domaine after a career in banking. Built in 1824, the two-story, four-bedroom château is a Neoclassical gem with perfect proportions. The orangerie, with its wood-beamed ceiling and paintings of life in the vineyards, is a particular delight. If Maroteaux operates on a small scale, Cazes, owner of Château Lynch-Bages, in Pauillac, thinks big. He was born into a Bordeaux wine family, and his father was mayor for 44 years of Pauillac, an area in the Gironde department that is home to three of Bordeaux’s greatest wines. He showed me the tiny house with blue shutters where he was born, and the site in Pauillac where the Americans and British dropped bombs in 1944, and where 30 people died in two days. We drove across dirt roads and stopped at a field of vines so that I could touch the soil and feel how porous and moist it was. “I’m not interested in selling you a bottle of wine,” Cazes told me. “I want you to feel so welcome that you will become an ambassador for my brand. I want you to say, ‘Oh, Lynch-Bages, I’ve been there! I was very well cared for!’ ” Cazes works with Stephen Bolger, the CEO and founder of Viniv, a small company that teaches clients how to create their own custom blends. The château harvests, mashes, ages, and stores the juice; the clients choose the vineyards and experiment with taste. There is a minimum commitment of one barrel for personalized wine, at an average price of $20,000. At 288 bottles in a barrel, that’s $70 a bottle. The process can be done on site or over the Internet. Left: The Harmony Room at La Grande Maison. Right: The 17th-century Château de Cérons. My last stop in Bordeaux was a picnic with the winemakers at Château de Cérons. Since 2012 Xavier and Caroline Perromat, a husband-and-wife team, have struggled to revive the 64-acre vineyard and château once owned by Xavier’s family. Xavier’s father, who had been mayor of Cérons for decades, allowed it to fall into disrepair and accumulated debt. He was so desperate he decided to sell. Xavier convinced his seven siblings—and the bank—to allow him to buy it. From the moment I struck the enormous iron door knocker of the château, I was back in the late 17th century. The wine cellar, the chimneys, the ceilings, the wall murals—everything was original. While the Perromats are slowly and painstakingly plugging leaks in the crumbling stone walls, sanding and repainting the elaborate woodwork, and updating the plumbing and electricity, they have also restructured the vineyard, pulled up old vines, replanted the best parcels, bought new barrels, and hired a young wine expert. The couple now invites tour groups to wine picnics on the grounds, a practice that has grown every year since they started in 2013. Visitors fill up wooden baskets from provisions kept in a cupboard in the main hall; fresh seasonal produce and, of course, the château’s wine round out the menu. On the day I visited, we dined in the orangerie, a fire blazing in its grand fireplace, on foie gras, duck rillettes, olive tapenade, potato chips made by a neighbor, and fresh tomatoes. Eventually the Perromats hope to set up a proper restaurant with a professional chef. Château Cordeillan-Bages An exquisite hotel with a Michelin two-starred restaurant set on a five-acre vineyard in the town of Pauillac. Doubles from $254. La Grande Maison Bernard Magrez’s elegant hotel has silk wall coverings, Carrara-marble bathrooms, and a wine cellar stocked with the region’s best. Bordeaux; doubles from $276. Le Boutique Hôtel The rooms at this wine-themed property are named after famous local wineries. Don’t miss the beautiful interior garden centered around a wine bar. Bordeaux; doubles from $210. Yndo Hôtel A converted 19th century mansion in the heart of Bordeaux. Doubles from $234. Brasserie Bordelaise The go-to place for tourists and locals seeking traditional dishes, like foie gras and fresh oysters. Bordeaux; entrées $13–$38. Restaurant Pierre Gagnaire Chef Pierre Gagnaire has made it his mission to turn this space into the finest restaurant in Bordeaux, with dishes like citrusrubbed veal with absinthe and quinoa. Entrées $69–$95. Soléna Standouts of Victor Ostronzec’s updated French menu include perfectly cooked asparagus carefully finished with pistachio vinaigrette. 5 Rue Chauffour, Bordeaux; 33-5-57-53- 28-06; entrées $36–$40. 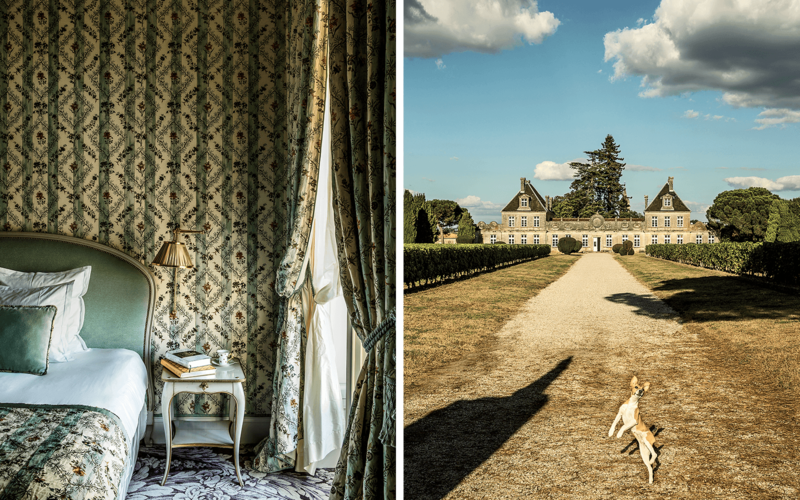 Château Branaire-Ducru This 19th-century château is a far cry from the stuffy Bordeaux wine scene—be prepared to be welcomed as if you were family. St.-Julien-Beychevelle. Château de Cérons Caroline and Xavier Perromat offer picnic baskets full of gastronomic provisions and wine to visitors at their vineyard. It’s an intimate experience not to be missed. Cérons. Château la Dominique This winery is hard to miss with its wonderful bright-red metallic cellar. The attached Terrasse Rouge offers meals highlighting seasonal specialties. St.-Émilion. Château la Grolet Two young vintners produce organic wines on more than 70 acres of land here. St.-Ciers-de-Canesse. L’Autre Temps One of the many quirky antiques shops in the Village Notre Dame, a covered mall located in the happening Chartrons district. Bordeaux. Petrusse This boutique stocks scarves and shawls in high-quality silk, wool, and cotton. Bordeaux. Cité du Vin The modern center sticks out on the Bordeaux skyline. It is a must-visit to understand the global impact of wine (from Bordeaux and other parts of the world). Plus, the wine bar, Latitude20, stocks 800 vintages from more than 70 countries. Musée d’Aquitaine A lovely museum taking visitors on a journey through the ages of Bordeaux and Aquitaine, with collections related to archaeology and ethnology. Bordeaux. Musée des Arts Décoratifs et du Design This former private residence, which houses more than 30,000 works of art, offers a glimpse into what life was like in the 18th and 19th centuries. Bordeaux. Musée National des Douanes This hyper-specialized museum traces the history of the French customs authority, but the real draw is the magnificent landmark building in which it is housed. Bordeaux.